While the ladder was ratchet strapped to the house, I climbed up onto the roof and snuck into the 2nd floor addition to check out the interior framing and see how everything looks. It’s so tough to tell what the size will really be when you are just looking at a computer screen or pictorial rendering of the print. The overall exterior size of the master suite is a little over 16’x21’. 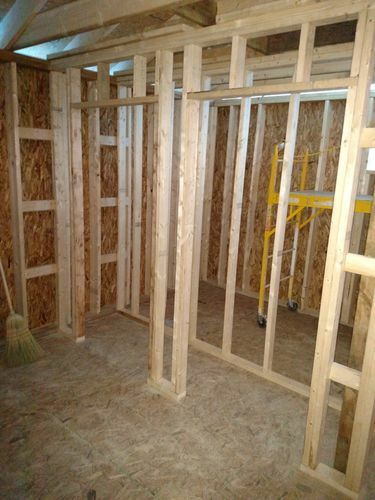 because of the stairs, walls, closets, etc., we should have a bedroom that is about 12’x12’, a bathroom that is 5’x12’, two full closets in the bedroom and a linen closet in the bathroom. 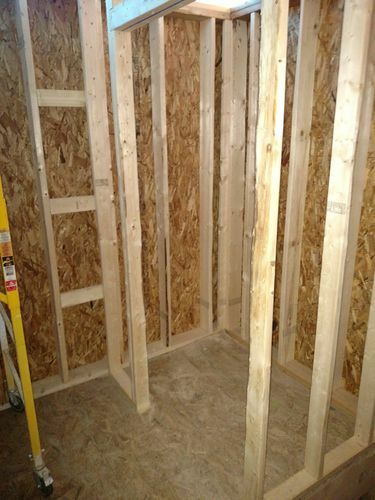 This is a shot of the bathroom, located on the West (front) side of the house. I was able to shimmy through the 12” tall window and onto the scaffold to gain entrance. Luckily, these pictures were taken in November. Had it been after the holidays I would have looked like Whinny the Poo stuck in a log. This is the main bedroom, which faces the East (back) side of the house. I couldn’t believe how big the window openings are! I knew what size they would be prior to getting into this whole project, but they still seemed a lot bigger than what I expected. This is the opposite view of the bedroom. The two openings will end up being the 2 closets. 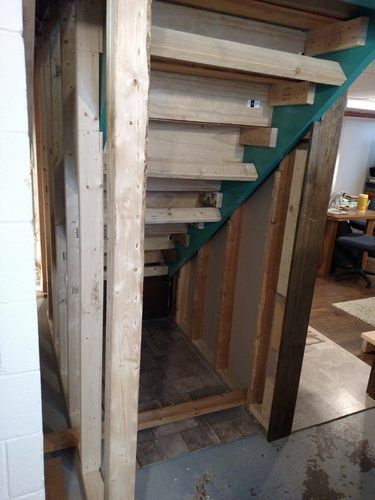 The stairs will be located on the North-most wall. Right not they have been packed with insulation to prevent the cold air from getting through and into my house. 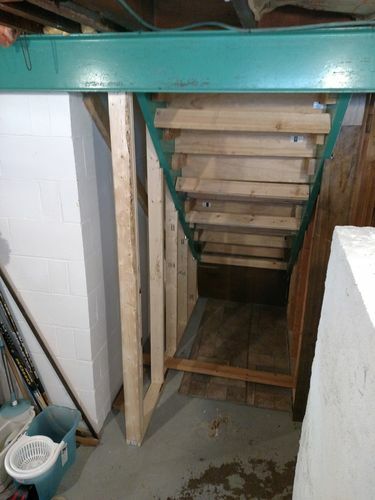 In the picture above there is a little area above the stairwell. 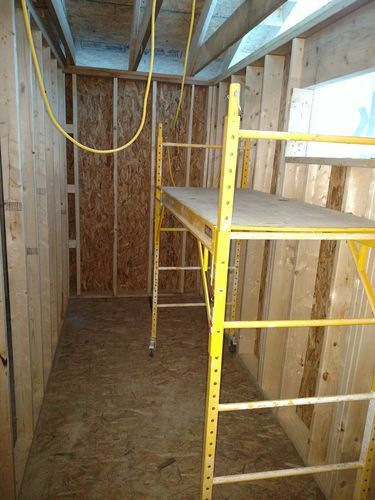 This will end up being the linen closet for the bathroom, and also eventually have access to the new attic space. 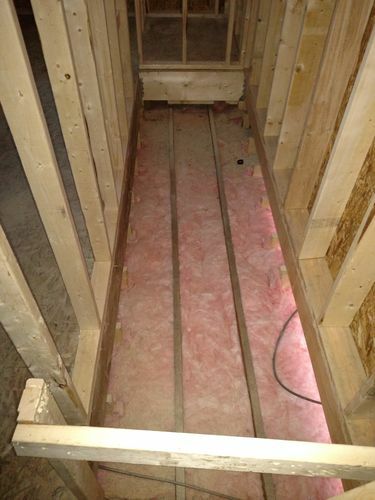 One last little bit of framing that was finished was in the basement Laundry room. 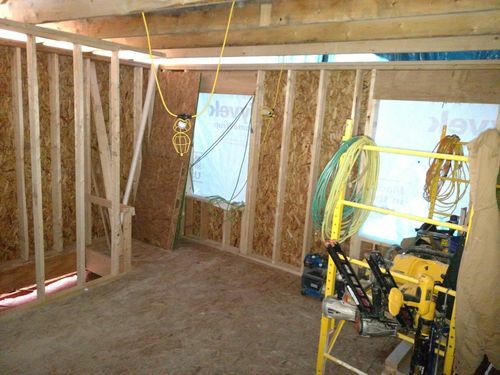 In order to reinforce the the load for the second floor, the contractors added this new stud wall. The bearing will eventually shift from an old wall to this newer wall, but its crazy to think that this little bit extra is necessary. Mike, you will have a whole new house just like you want, too! Hats off for taking on a project like this instead of moving. Most people take the latter. With you doing some of the work yourself will be a good idea to keep an eye on things. So far so good.